"Some people assume that all therapists are new-agey hand-holders who just listen and nod like bobbleheads, then suggest an astrology reading, a gluten-free diet, and your choice of complimentary love flower or polished healing stone on your way out the door. That's not me. My job is to help fix what's broken." Speaking to the layperson and the practitioner alike, even Rick's signature humor can’t hide his wisdom, his deep understanding of mental illness, his desire to help heal it quickly and effectively, and his pragmatic and often creative approach to treatment. "It’s a really excellent and playful book. Extremely readable. It's making me think about becoming a therapist." "As a retired social worker who has also worked with abused individuals, I applaud your simple, direct, informative and realistic writing." "My wife and I were still up at 2 AM reading your book... and I had to be up for work at six!" 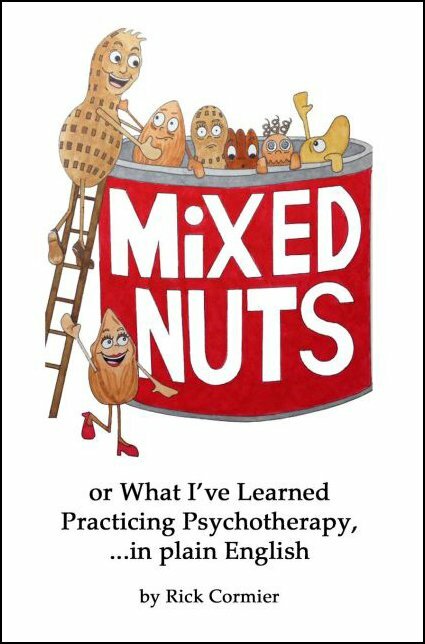 "I ordered Mixed Nuts for my Kindle which says I've read 50% in my first sitting! Your anecdotes and humor are riveting, and depression guidelines helpful."